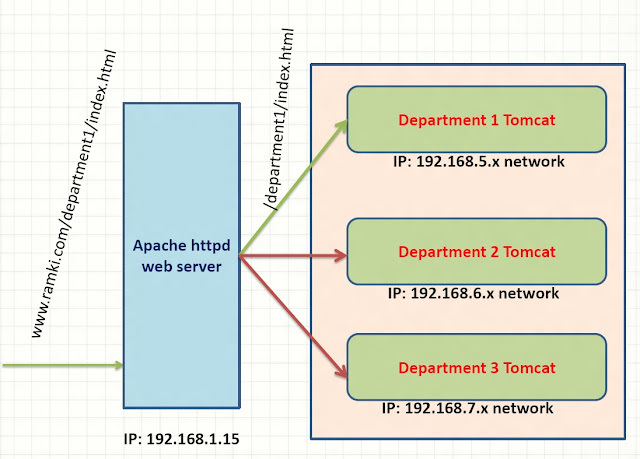 In my last post (Virtual Host in Tomcat) we discussed about how setup the virtual host in Tomcat. 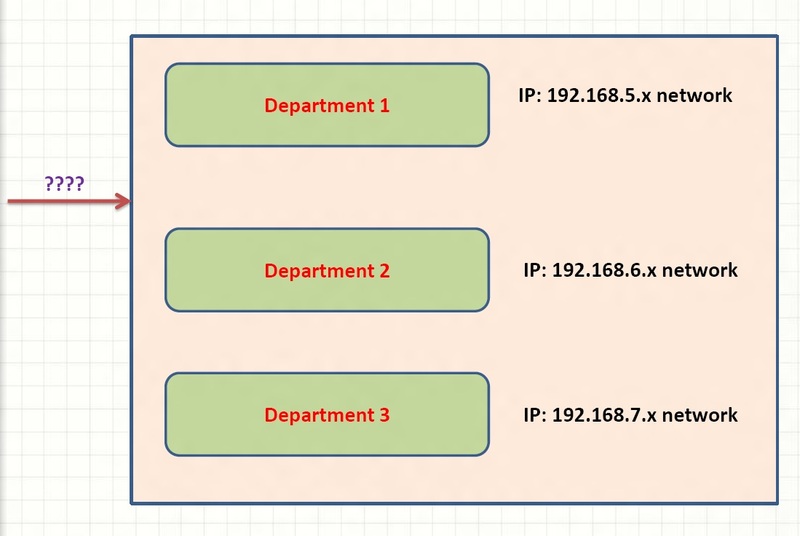 Its cost effective technique because only one public IP is enough to host multiple domain. If we have big organization and each department want to host their website in locally in different machine. then how to achieve the virtual host concept?. In this post we will see the how we do this. In big organization they have multiple department, each department want to host their website in different machine. so these websites are accessed locally with different local IP address. When we mapping to public address then we face the problem. We have two choice either purchase as many public address or Put one server front and delegate these request. We going to use 2nd option. 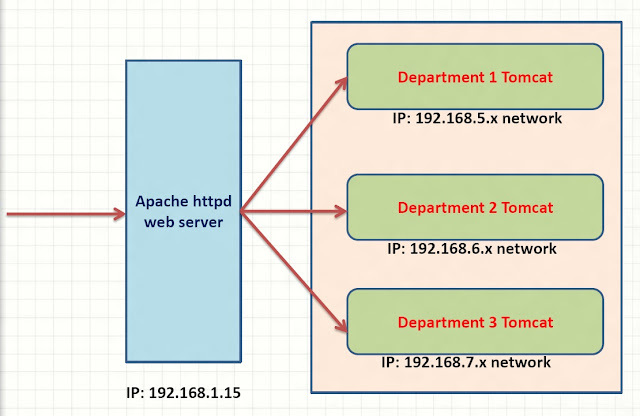 we put Apache httpd web server in front of all department servers. so only one public IP is enough. All domain DNS entries are pointed to Apache httpd server. Then Apache server delegates these request to corresponding tomcat server. This process is completely transparent from users(browser) perspective. How many ports are bind when we start single tomcat? The port configuration are stored in $CATALINA_HOME/conf/server.xml file. we can change the ports when its necessary. here AJP(Apache JServ Protocol) is a binary protocol that can proxy inbound requests from a web server through to an application server that sits behind the web server. 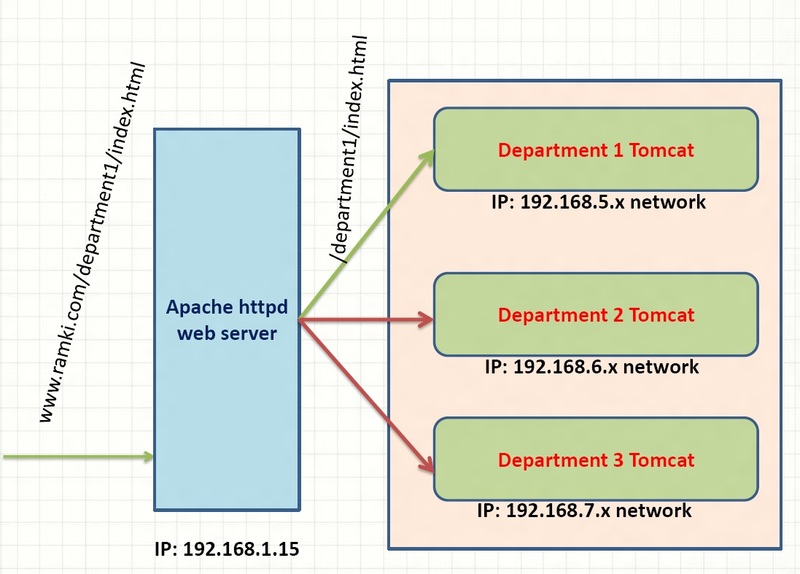 Apache httpd webserver communicate to Tomcat sever through AJP protocol. When we install Apache httpd server, It don't have inbuilt capability to support ajp protocol. so we need mod_jk module. Its add the ajp support to Apache httpd server. Prerequisite : We already installed Tomcat in different departments and deployed the application and works fine. We can install Apache web server in two ways. We can install Apache httpd server from distribution package manager (either apt-get or yum). Or we can download the source code and then compile and install. we need to install apr, apr-util and pcre libraries because Apache httpd server depends on these libs. But these libraries are no need to install from source. because we not going to do any customization. so install these lib as binary using apt-get (debian/ubuntu) or yum command (redhat/fedora). --prefix option to mention where the location we going to install Apache httpd server. --enable-rewrite and --enable-proxy options to enable these module in shared mode. These modules are not needed now. but we used in future for rewrite the URL before handover to next chain of servers and load-balancing support. Now Apache httpd server is ready. we need to add ajp support to server. here --with-apxs option to specify where apxs module is located. 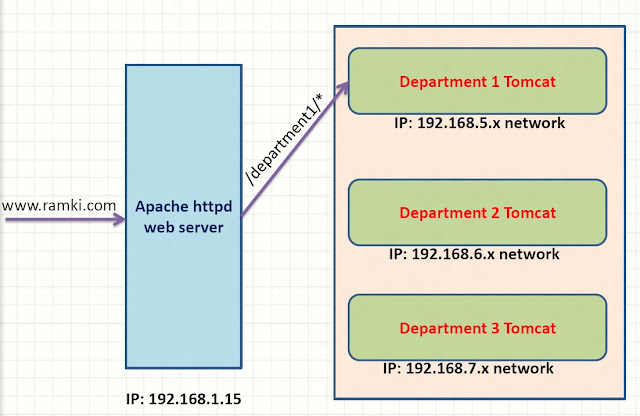 so we need to give Apache httpd server location. here we define the workers. i.e all department tomcat hosts IP address and ajp port for corressponding tomcat. worker.list key have all workers name separated by comma. we need to configure the httpd server. all others are logging system of mod_jk. Its boilerplate code just copy and paste. now we inform to Apache httpd server how delegate the request to corresponding server. JkMount - specify the if URL have /department1* pattern then that request delegate to department1 worker. that worker IP address and port is specified in workers.properties file. Iwe changed /etc/hosts file like last post all web site domain pointed to apache httpd web server. Its perfectly called correct tomcat server and we got right response. remove the department1 from my URL. but department1 string is very important in URL because JkMount is works based on this matching string only. because both these URL have department1 key word.. so JkMount is works based on these keyword. As the Result wrong interpretation. How to solve this Issue?. we need add conditional JkMount. for example ramki.com domain asks the whereare paths like department1,department2 we need to search in that tomcat only. not other place. to add this conditioned we add virtual host entries. If http://www.krishnan.com/department1/index.html URL is like this now. server matches the Server Name. here its matches 2nd virtual host entry. There are single JkMount entry is there in 2nd Virtual-Host. and there no matching department1 string. as the result 404 error page is responded. Its works good. now my URL is http://www.ramki.com/department1/index.html here i don't want department1 path in my URL. Rewrite is happen before delegate the request to Tomcat. so we change the URL transparently to browser. now client (browser) just send http://www.ramki.com is enough to access the Department 1 Tomcat.